Leith Athletic manager Derek Riddel was pleased to see his side master the conditions as well as the opposition on Saturday as a 3-0 win at Heriot-Watt booked the Premier League leaders their place in the semi-finals of the Image Printers Cup. Watt were looking to extend their unbeaten run to seven games at a rain-soaked Riccarton, while Leith were looking to return to winning ways after their ten-game unbeaten league run came to an end against Spartans EOS in a 5-3 defeat. The home side came agonisingly close to opening the scoring after just eight minutes when Cammy Stephenson’s volley went inches over the bar, before Elliot Sutherland struck the post with the Leith defence having to clear their lines. Watt were made to rue those missed opportunities as Athletic went ahead on the half-hour mark when Stephen Baigan finished off a well-worked move. With conditions worsening, both sides did their utmost to create chances, but the visitors doubled their lead on 63 minutes when Robbie Mason headed in from Euan Campbell’s cross. That goal deflated the home side and Leith’s passage into the semis was sealed with 20 minutes to go when Sean Murphy slotted home from close-range, with youngsters James Hainey and Kerr Allan combining well to set up the goal. Watt missed their chance to grab a consolation at the death when Chris Donnelly’s spot-kick struck Ian Gordon’s post. 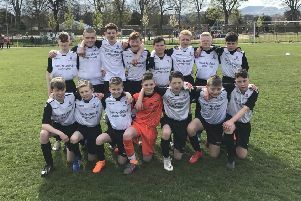 Leith will now meet the winners of the re-arranged Edinburgh City versus Coldstream tie, and Riddel was pleased to see his side master the elements as well as the opposition. Heriot-Watt coach Chris Smith was pleased with the efforts of his young side but was disappointed with the manner in which his players conceded the goals. Meanwhile, in the Central Taxis League Cup, Easthouses Lily disposed of First Division side Duns 3-1 at Newbattle Complex. Dave McQueenie’s men were not at their best, but goals from Mark Brown, Craig Brown and Paul McDermott booked their place in the semi-finals, where they face either Leith Athletic or Lothian Thistle Hutchison Vale in the new year. Michael Stewart netted a late consolation for the Border outfit. In the other tie at Fernieside, Davy Stewart netted two goals for Spartans EOS as Alex Cunningham’s outfit defeated Tynecastle 2-1, with Jamie Devlin on target for the home team. The Ainslie Park men have a home tie against either Civil Service Strollers or Coldstream. Lothian Thistle Hutchison Vale climbed to third place in the Central Taxis Premier Division to move within a point of joint leaders Leith Athletic and Easthouses Lily with a 3-2 win over Civil Service Strollers at Saughton. Kevin Twaddle’s side had to come from behind after Chris Tobin put Ross McNeill’s team in front. Second-half goals from Liam O’Donnell, Alan McDonough and a John Williams penalty gave Lothian the advantage although they had to endure an uncomfortable final ten minutes when substitute James Guy gave Civil hope with a second goal. There was also further good news for Twaddle as Scott Moffat – out for three months with a dislocated knee – made a late substitute appearance. “It was great to see Scott back playing because he’s a firm favourite with the other boys in the dressing-room. He’s been doing extensive work with our physio ever since the injury and he’s kept himself in good physical shape,” said Twaddle. Craigroyston missed the chance to lift themselves into seventh as second-half goals from Thorfinn Stout and Jason Bolam gave Stirling University the win after Ross Nisbet had put Gary Aitchison’s side ahead in the 12th minute. In the Central Taxis First Division, Ormiston kept up the pressure on Peebles Rovers with a 2-1 win over Burntisland Shipyard. David Ross and Declan Quinn were on target after Dale Robertson had given the Fifer’s a first-half lead.